Our guests spend the night in clean, comfortable, spacious, climate-controlled, quiet accommodations. Throughout the day, dogs staying at DePaw enjoy plenty of exercise, attention, and affection from our staff. We pride ourselves on catering to your pet’s needs in any way we can. 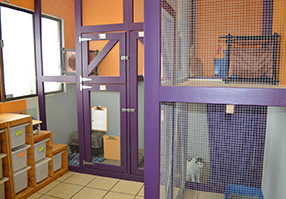 Boarding is available for canines, felines, ferrets, rabbits, and other small mammals. We strongly discourage you from bringing your pup’s favorite toys or big beds. We do not want your pup’s favorite toy ending up in the play area where the toy could be torn up or lost among the other toys. We encourage blankets or beds that can be easily washed in case of any accidents. 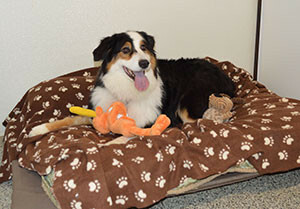 We also have a large supply of blankets, beds, and cots available at no additional charge. At your request, for an additional charge, we can supply your dog with pig ears and/or treats during quiet time in their own area. Of course, if you bring your own treats, no charge! Special requests such as medicines, extra treats, or special care for older pups and other requests are usually no problem and no charge. We can board puppies under 4 months of age, but they will not be able to participate in the daycare programs. 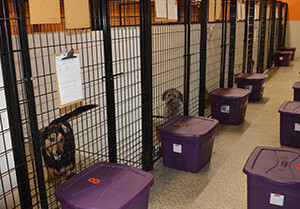 Proof of up-to-date vaccines is required before bringing your dog to our facility. Click here to visit our Policies page for more information.